Rain, rain and more rain! Over the last couple of weeks we have been getting hit with rain almost every single days. Some days we get at least a couple of inches at a time. Thus for the last week we have had large puddles of water all over our campsite and in the picnic area. One good thing is that we cannot mow. The bad thing is the grass grows faster when its wet. The temperatures in the evening and early mornings have been kind of nice too. But we still have temperatures in the 90s. Well, duh, it is August in Florida. We finally got the lawn mower back before this latest batch of storms hit and I had the day use area about 3/4 quarters of the way mowed after 2 days when the Fire Fighter guys showed up. They finished off what I hadn’t done yet as well as both sides of the roadway all the way to the Old Train Depot and blew off the parking area for me. THANKS GUYS! We really appreciate your help. But not hours after I had cleaned all the fallen limbs and mowed around the trees, barbecue grills, moved the picnic tables back to where they were supposed to be and large trash bins we got a little gust of wind and a huge pine tree limb fell down. Boy, talk about being ticked off. Luckily though I was in another area of the park when it fell. That would have probably have hurt. I took a picture of it (See above) and forwarded to the ranger. He came the next day and towed it off into the woods. 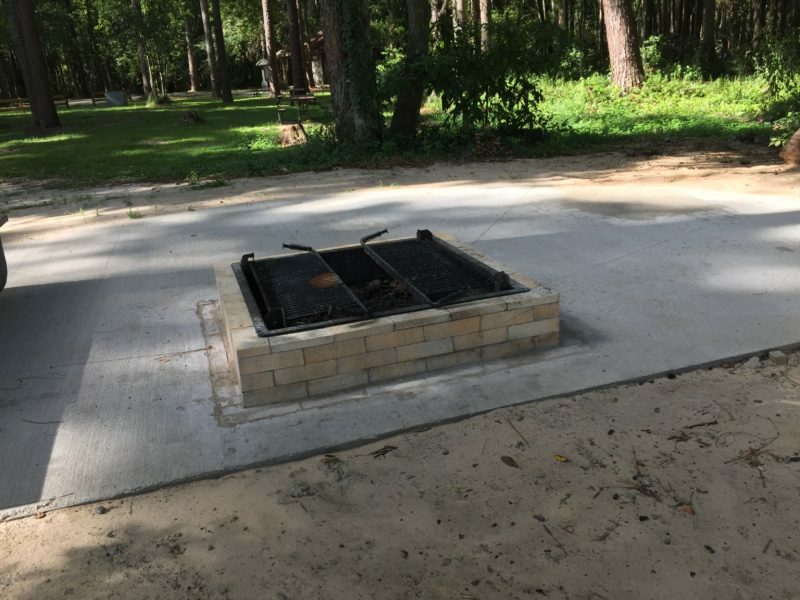 The recreation manager here in the Osceola National Forest has been trying to make some improvements and necessary repairs as time, money and qualified personnel allow. One of which is the new sidewalk and large barbecue/fire pit at the Group Landing. That turned out really nice and they finished it last month. Earlier in our stay here she tried to have a group of forest personnel to come in with some kind of large metal rack on a chain to try and clean out all the vegetation in the swimming area. They would pull the thing out into the water and a truck would pull it back towards shore. That didn’t last very long though after the second or third batch there were a couple of large snakes within the grass so they stopped what they were doing. After sitting around for a couple of hours waiting for some kind of tractor to come and help they decided to call it a day. The drug up vegetation stayed on the beach for about a week before a tractor and dump truck finally came and picked it up. Now the manager is having to get bids from private contractors with small dredging boats to clean up the various areas around Ocean Pond. We probably won’t see that done before we leave in at the end of September though. Another project that did get done was the replacement of the information signs along the Trample Track Trail. It is a short short which explains about the earlier use of the area for cutting down timber, floating the logs in the pond until they could be taking into the mill for processing. There was even a railroad track around the lake. The information kiosk were painted onto fiberglass and had gotten faded and cracked. There is more to the trail than the pictures below and I thought I had them but I will take some more to add to our movie once we get that going after we leave here. We still haven’t gotten another volunteer in the other workamper campsite and don’t look to have one before we leave. The golf cart they told us we had to use broke down and was in the shop for about a week. It doesn’t have lights on it so it is no use to us for night time closing. During the weekends our visitors just don’t seem to want to leave. Also, the golf cart is not 4-wheel drive nor does it have knobby tires for traction. With all of this rain we have had to use the larger ATV. We are not supposed to use it because we haven’t been “Trained” by an authorized teacher yet. There is only one of those and he/she travels around the various National Forests trying to get the park personnel trained before any of the volunteers are. Even though we have been driving them for over 3 years now. Government! Their regulations just don’t make any sense sometimes. Anyway, that’s my rant and update for this week. Hope to be posting again and more often now that Katie has come back to help us out. Poor Mom tripped in the RV the other day and can’t put any weight on either of her legs. Nothing is broken and just barely swollen but she can’t help out for a while yet. My brother and Katie made us a nice set of wooden steps for the front of the RV but she will not be able to go up or down for a little while yet. 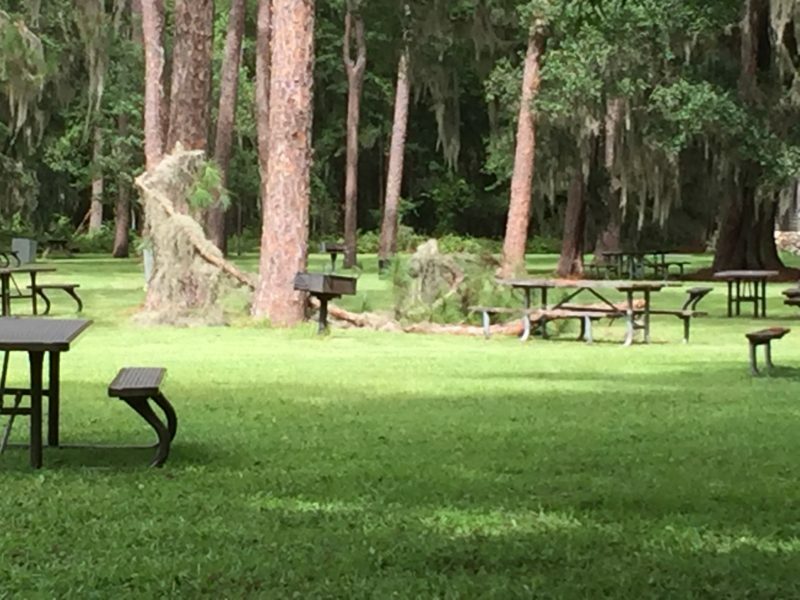 Insider’s Guide to Campground Hosting in Florida Parks! Early retired mom and grandmother who is traveling around Florida with her mom volunteering in Florida Public Land areas, creating handcrafted jewelry to sell, writing blogs and publishing books as we go.